Once again, we get visual proof that it pays to check out Nature’s outstanding engineering tricks in order to work up interesting machines that behave in innovative ways—for machines, that is. BionicWheelBot is inspired by the flic-flac spider. Together with the professor, the Festo bionics team explored the spider’s movement patterns. In rolling mode, said Festo, the artificial spider – like its natural role model – is much faster than when walking. It can move itself forward even when on rough terrain. How does it make a wheel? 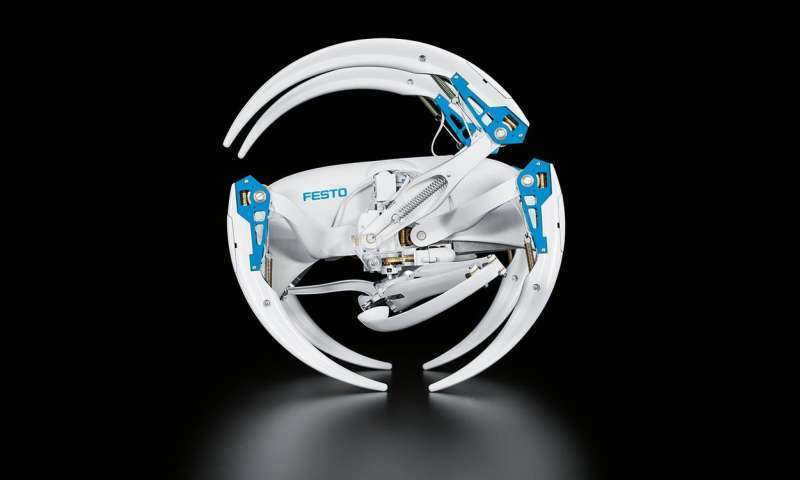 Festo said that to start rolling, it bends 3 legs each on the left and right of its body to make a wheel. The 2 legs that were folded while walking then extend, push the rolled-up spider off the ground, and push it forward while rolling. The spider-like walk-and-roll robot is all set for the Hannover Messe 2018 industrial technology fair from April 23 to 27. Hannover Messe is billed as the world’s leading trade show for industrial technology.